(May 31, 2017) -- Carla Juarez grew up in a small Texas town, and although neither one of her parents attended college she was a star student. With the second highest grade-point-average in her high school, Juarez expected to breeze through college. Yet there she was, 100 miles away from home, guiding herself through the unknowns of college life, the admissions process and how to pay for tuition. When you're a first-generation student, everything is just a little harder to navigate. "My parents didn't finish high school, they didn't even finish elementary school," said Juarez, a junior majoring in accounting at The University of Texas at San Antonio (UTSA). "They had no idea how to help me in high school, so I did it on my own. I applied to college on my own. I looked for scholarships on my own. I know they couldn't help me as much, but they were as supportive as they could be and were there for me." 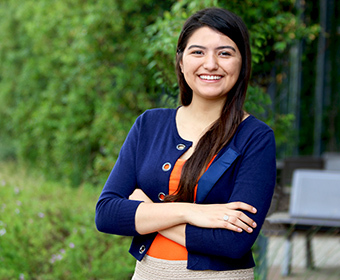 With more than 11,000 first-gen undergraduates at UTSA, Carla isn't alone. She joined and became vice-president of First to Go and Graduate (F2G&G), a student organization which has 64 members. "First-gens don't always have someone who knows what's going on," she said. "I want to help them get involved on campus, and I want to be there for them when they have questions." Recently the student organization, along with several campus offices, hosted First-Gen Fest to raise awareness about the experience of students who are the first in their families to complete a four-year degree. Some 100 students, faculty and staff showed up to the event, displaying their "I am First-Gen" t-shirts, buttons and signs. Participants included interim President of UTSA, Pedro Reyes, who is also a first-generation student. The event was a success, said Carla, who smiles when she spots a student still wearing the shirt. "It's like there's an immediate connection, I can relate with them," she said. In between classes, working with F2G&G and helping with the Student Government Association, Carla tries to visit home at least once a month. Her father, a stone worker at a quarry, and her mother, a custodian at an elementary school, have worked hard to try to alleviate the cost of tuition for Juarez. With college tuition and expenses on the rise, Carla works part-time on campus and relies heavily on scholarship support. So far she's managed to make her way through college debt-free thanks in part to donor support. "First-gen students are very determined," said Juarez, who will be interning at PricewaterhouseCoopers in January. "We don't take our education for granted and are grateful to have the opportunities that our parents didn't have." Learn more about First to Go and Graduate at UTSA.